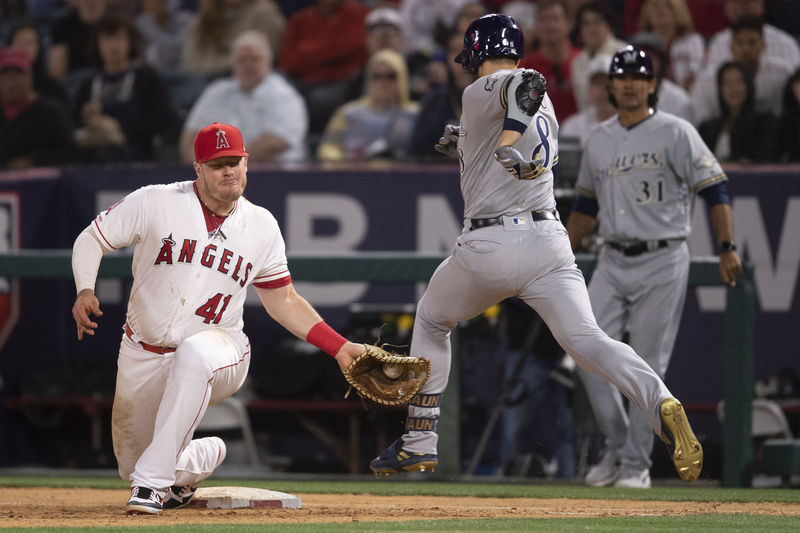 ANAHEIM — Mike Trout was thrown out trying to advance to second base on a ground ball in the second inning Tuesday. 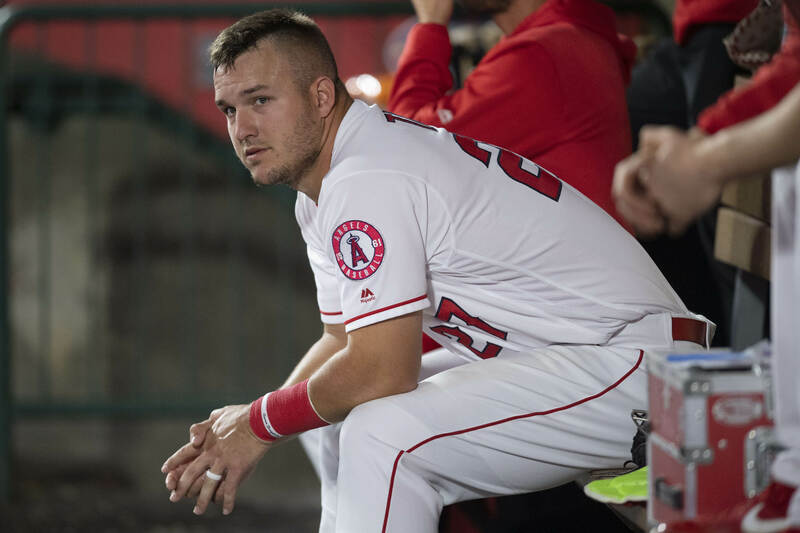 Between the time he took off running, and the time he popped up from his slide, Trout strained his groin. He played another half-inning in the field then was removed from the game. Within an hour, a strong breeze picked up above Angel Stadium. Soon the outfield was full of brown napkins, empty bags of peanuts and Cracker Jacks, and Peter Bourjos standing in Trout’s usual position – an appropriate metaphor for 3 hours and 50 minutes of baseball that ended in a bittersweet 11-8 win before an announced crowd of 28,793. 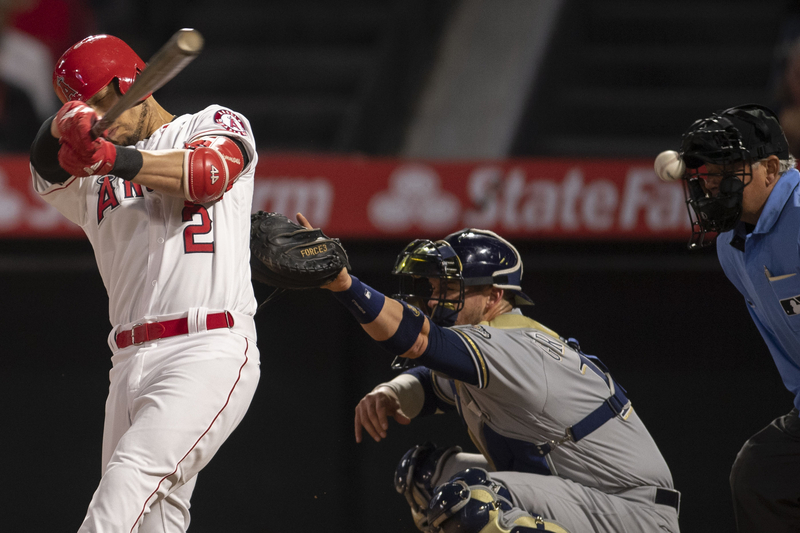 Though minor, Trout’s injury carried the potential to overshadow the Angels’ fifth consecutive victory. Trout has never gone on the disabled list with a groin injury. Officially he’s day-to-day. Trout is also a future Hall of Famer at or near the peak of his powers, and any threat to his health is a threat to the Angels’ well-being as a whole. For a day, the Angels found a way to overcome. 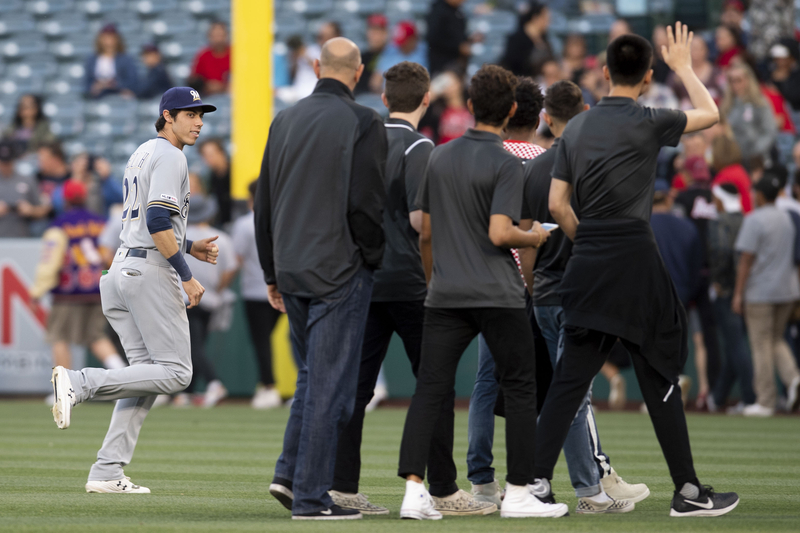 They scored six runs before they made their third out, but by the fifth inning were mired in an 8-8 tie. 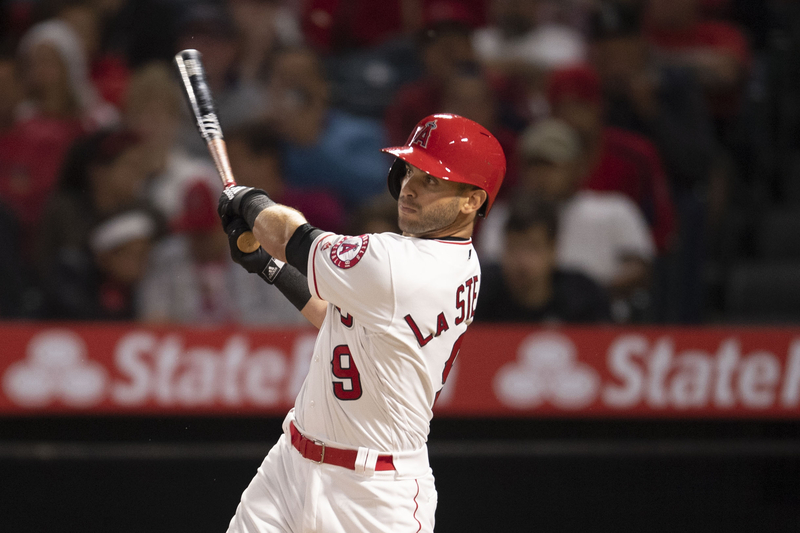 A two-homer game from Tommy La Stella and a pair of late rallies ensured victory. 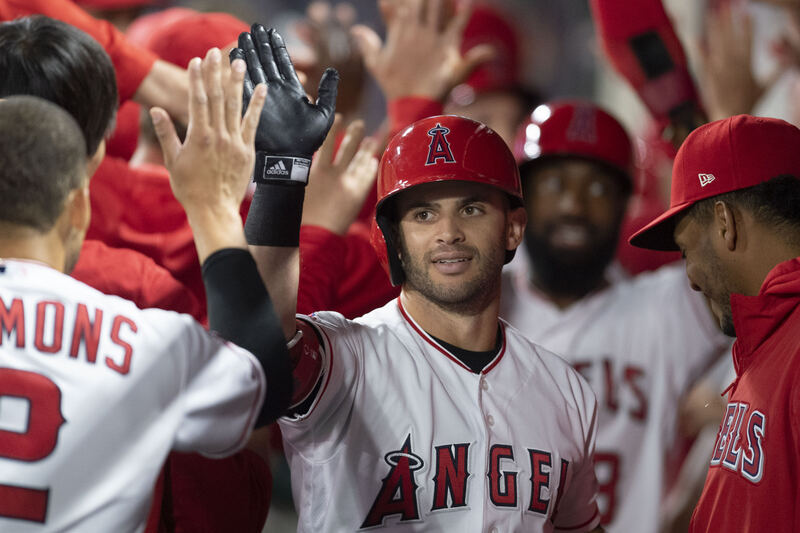 The Angels (6-6) can complete their first series sweep on Wednesday against the Brewers (8-4), who came within one game of reaching the World Series last fall. 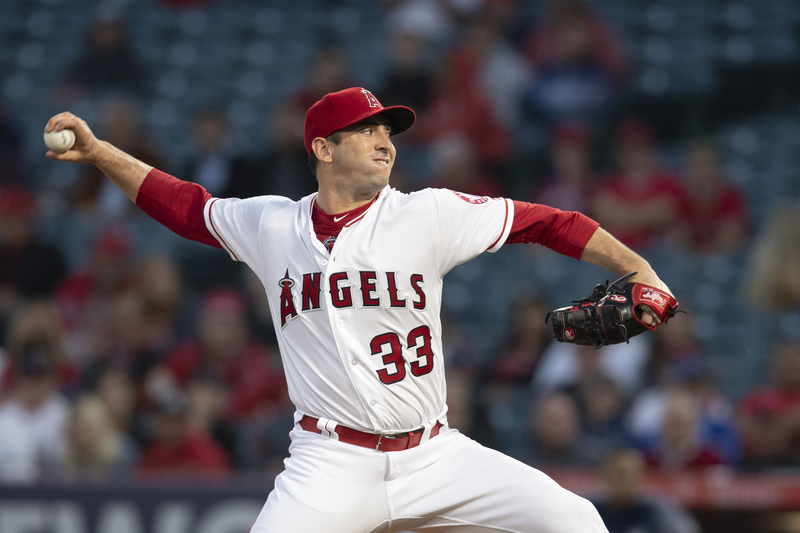 Already, the Angels have orchestrated a remarkable turnaround from a 1-6 start. 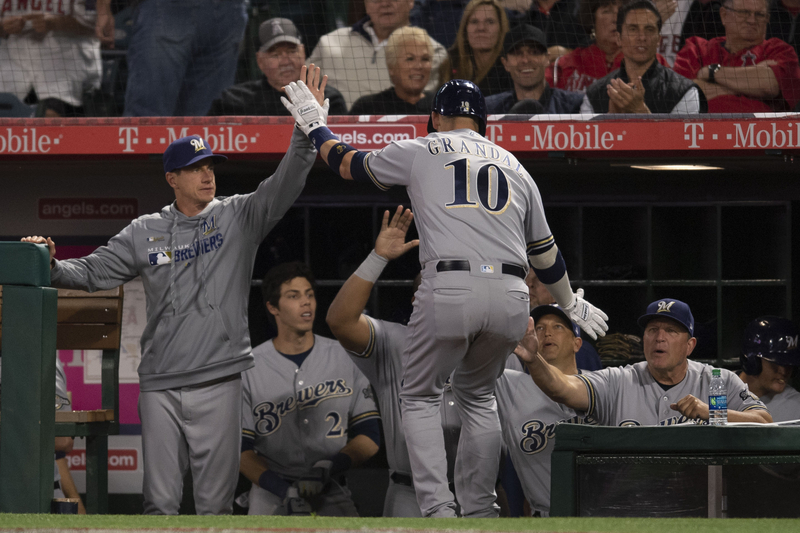 An unorthodox seventh-inning rally provided the game-winning run. 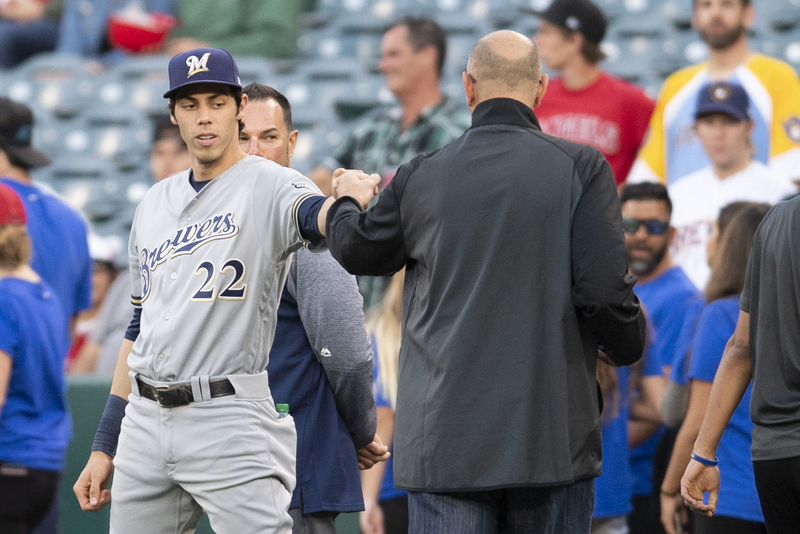 The score was tied 8-8 when Brewers left-hander Alex Claudio (0-1) walked Justin Bour and was promptly replaced by right-hander Alex Wilson. Andrelton Simmons singled, and a wild pitch moved both runners up a base. 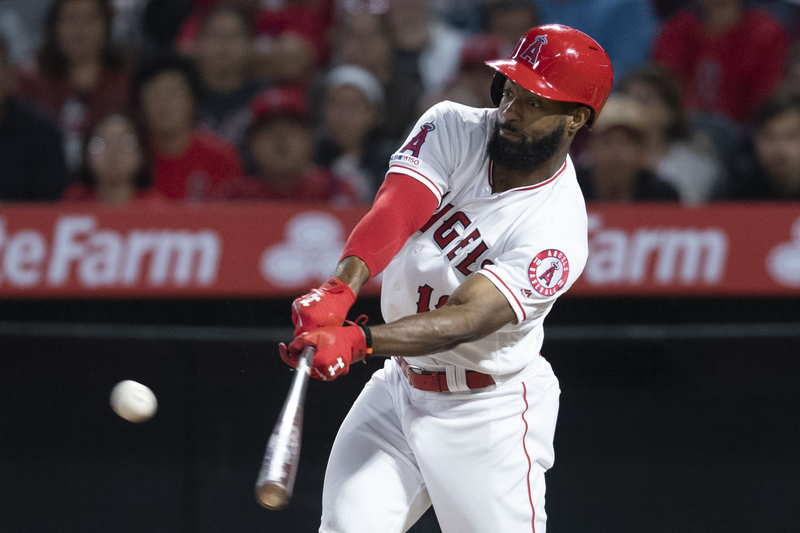 After Albert Pujols grounded out, leaving first base open, Wilson intentionally walked Brian Goodwin. That brought up Jonathan Lucroy. 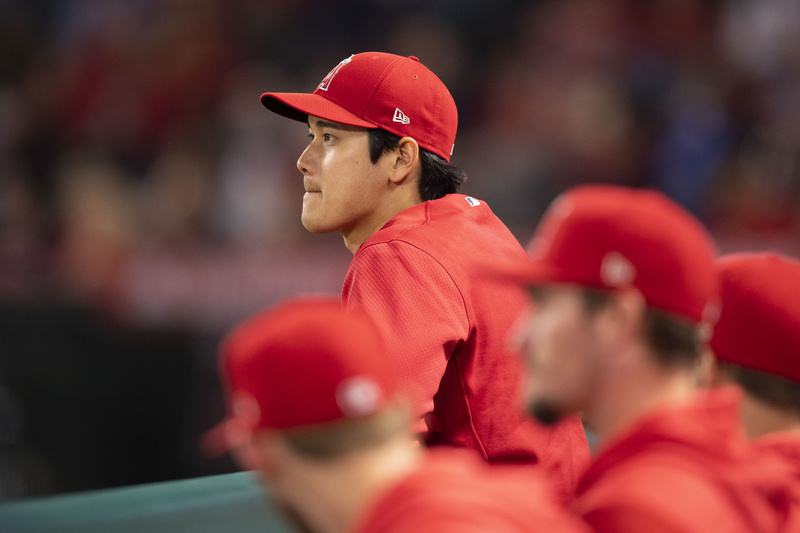 He saw four consecutive pitches out of the strike zone, and Bour walked in to give the Angels a 9-8 lead. 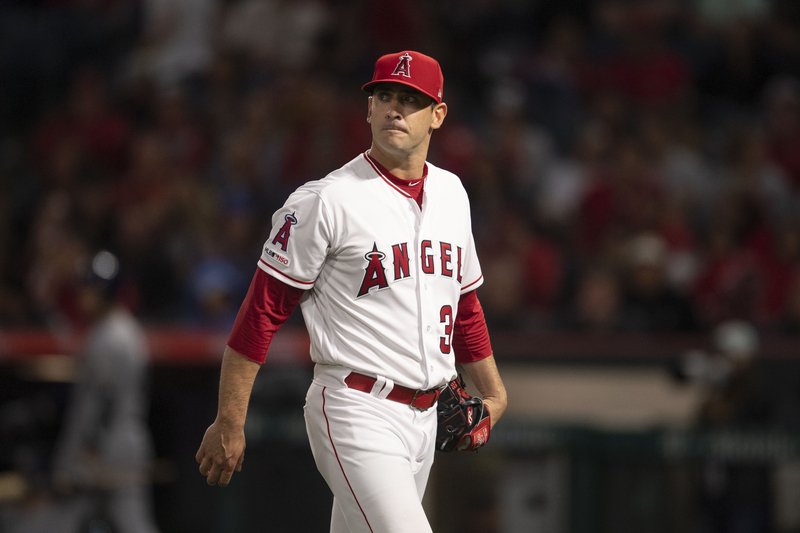 In the eighth inning, the Angels drew two more walks, their fifth and sixth of the night, to pad the lead. With Kole Calhoun on second base and Bour on first, Simmons pounded an RBI single to left-center field. Pujols drove a line drive to the left-center gap, where Lorenzo Cain made a diving catch to deny Pujols his 3,092nd hit. Bour tagged up and scored the Angels’ 11th run. 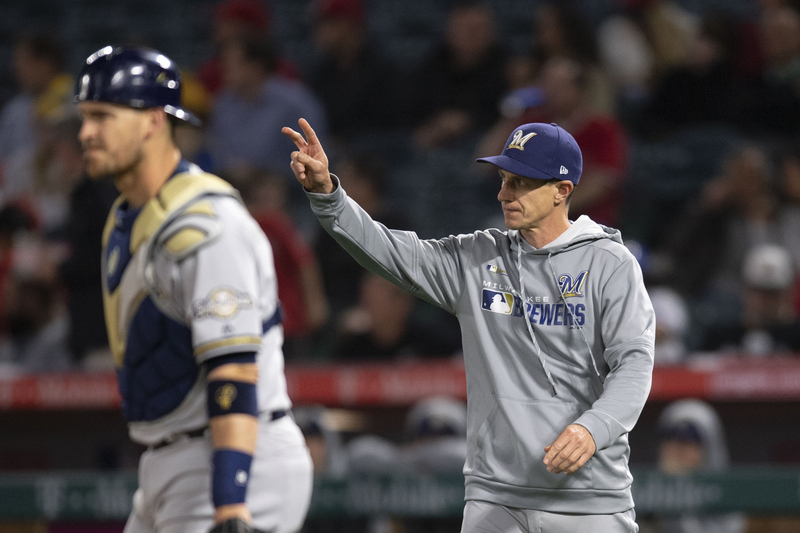 Jake Allen pitched a scoreless ninth inning for his second save in as many nights. 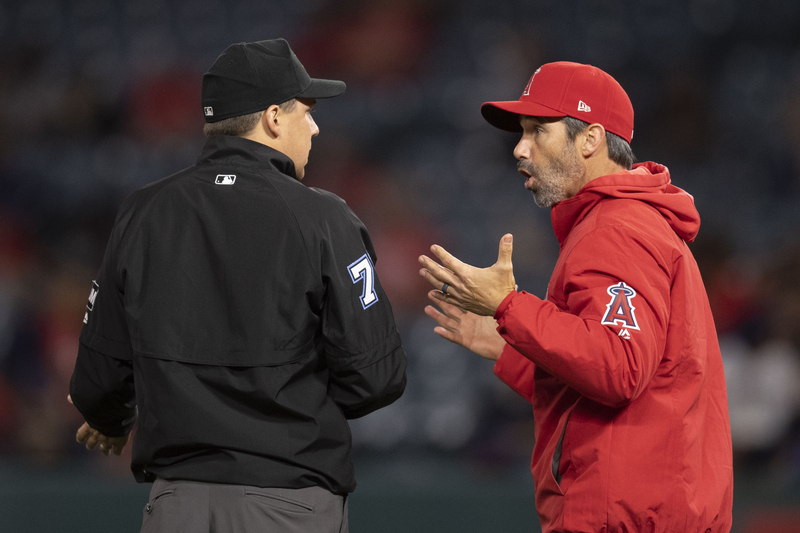 There were few clean innings on a night that saw 19 runs, 22 hits, nine walks, one catcher’s interference call, a successful challenge by the Angels, and an injury that knocked out home plate umpire Tom Hallion in the third inning. Hallion’s face mask was clipped by a foul ball by Simmons. Todd Tichenor replaced Hallion and the game proceeded with three umpires. 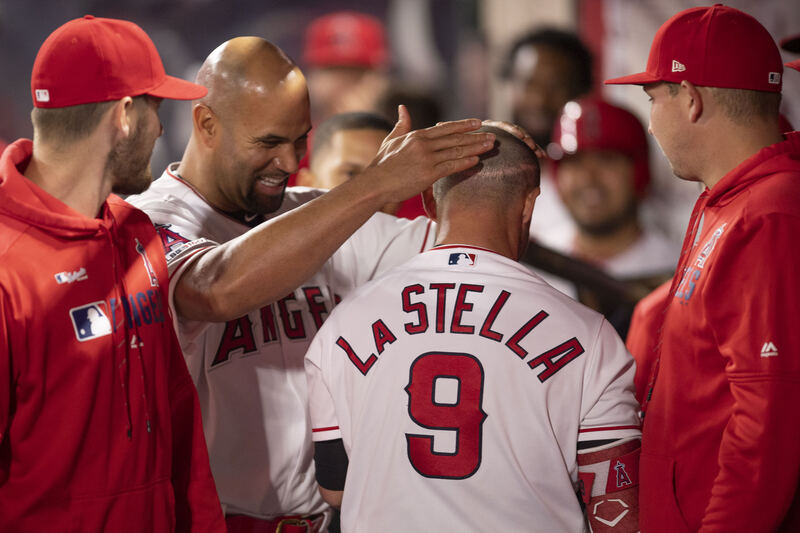 La Stella’s home runs were just the 12th and 13th of his career. He drove in four runs from the number-8 spot in the batting order. Lucroy, the number-7 hitter, drove in three. 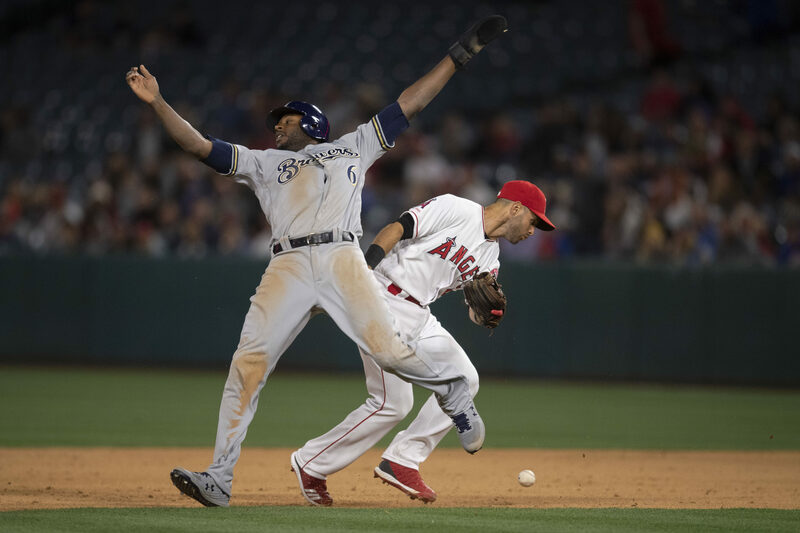 The Angels knocked out Milwaukee starter Freddy Peralta in the fourth inning. 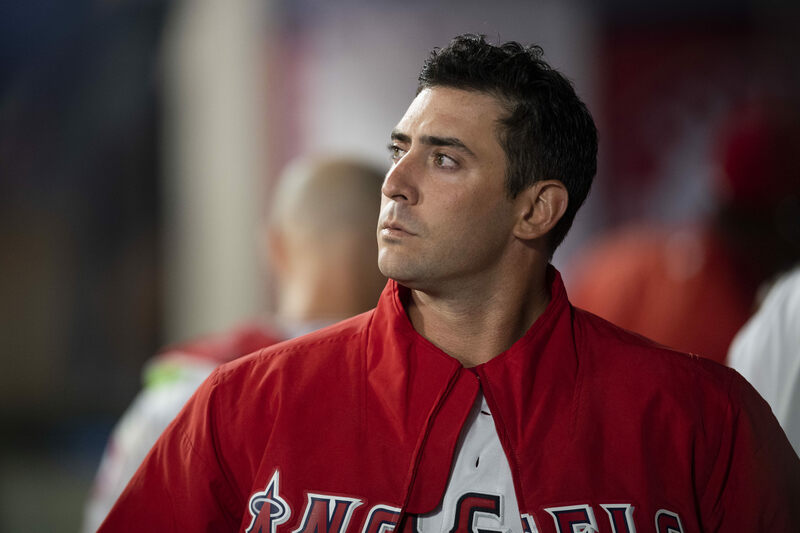 Angels starter Matt Harvey was charged with six runs in 4⅓ innings, but still left with a 7-5 lead. He walked Travis Shaw on his 89th and final pitch. 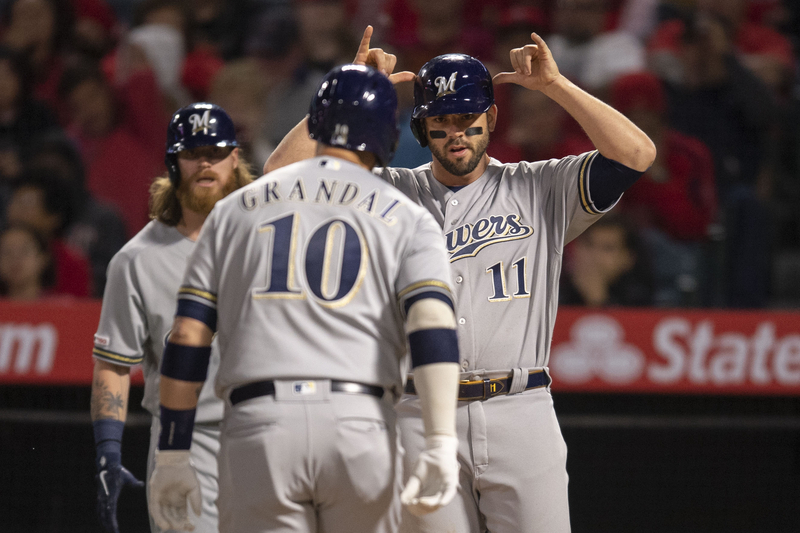 Luke Bard took over and allowed back-to-back home runs to Mike Moustakas and Yasmani Grandal. With that, Milwaukee led 8-7. 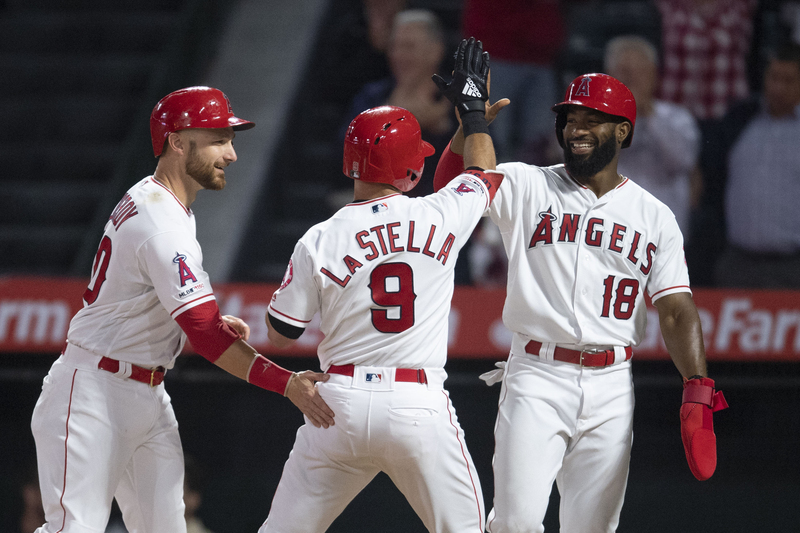 The Angels used five singles and La Stella’s first homer to score their first six runs – all with two outs in the first inning. Trout shot an opposite-field single through the shifted right side of the Brewers’ infield with one out. Justin Bour followed with a single of his own to center. 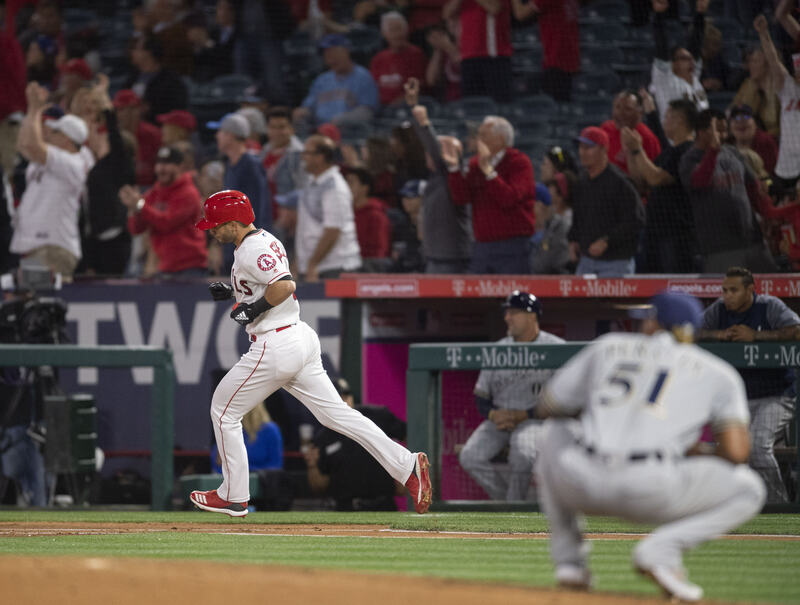 With two outs, Pujols roped a single to right-center field, scoring Trout. Goodwin poked a single to right-center, scoring Bour. 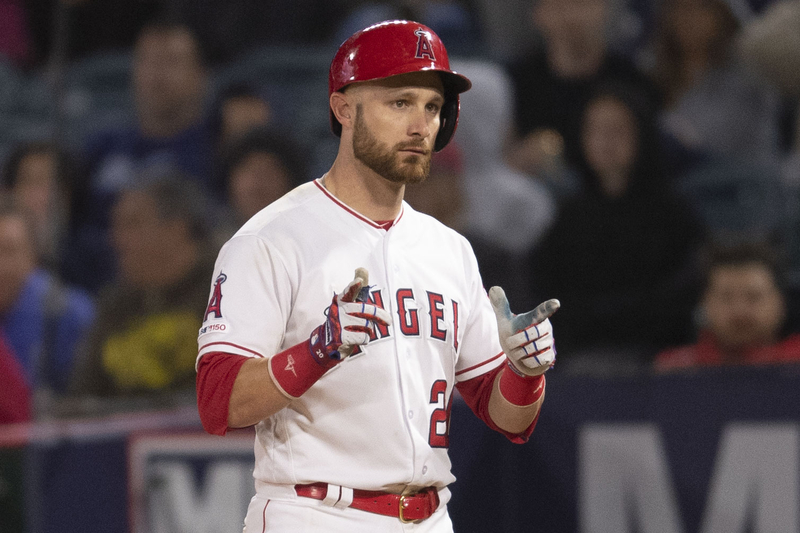 Lucroy hit a single to center field, scoring Pujols. 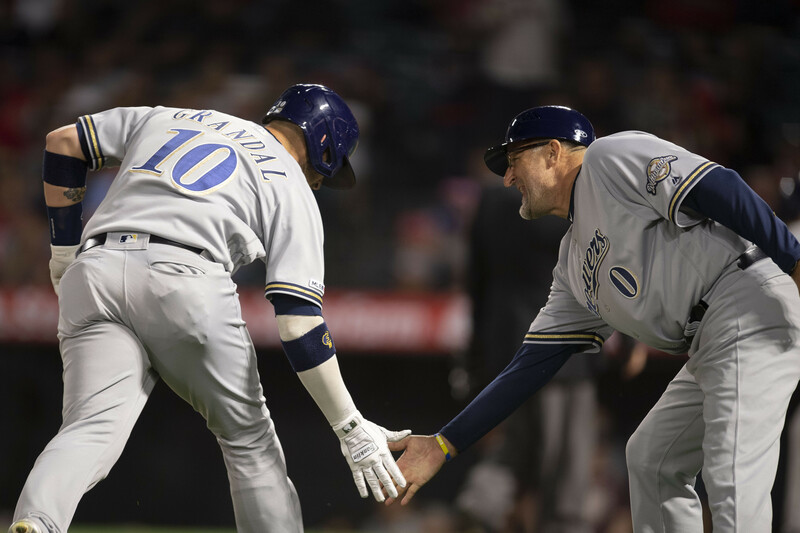 Down 3-0, Brewers pitching coach Chris Hook visited Peralta to pause the onslaught. The meeting didn’t help. La Stella worked a full count, then ripped into a Peralta fastball down the middle of the plate. Quickly, the Angels led 6-0. 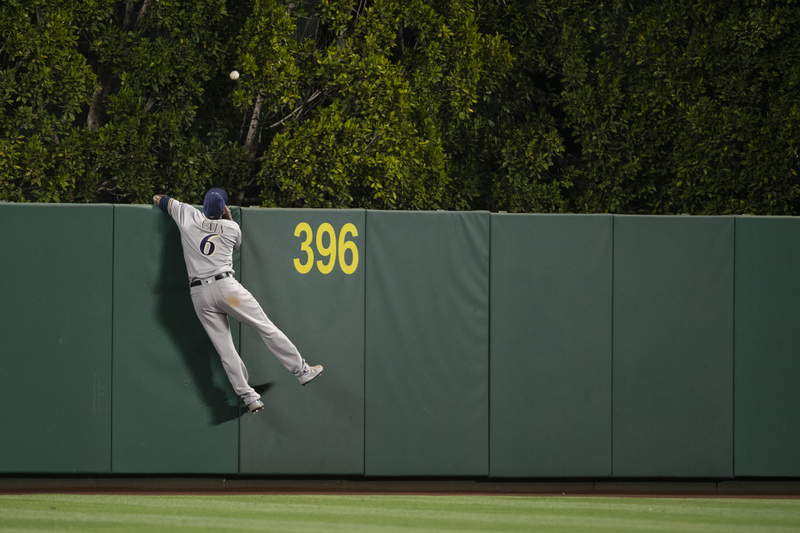 The Brewers scored three runs in the second inning and two more in the fourth against Harvey. 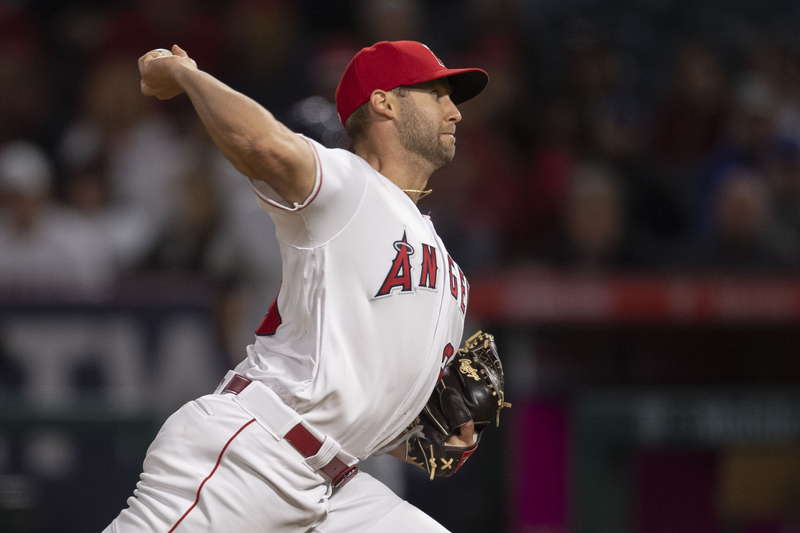 After Bard’s hiccup, Cam Bedrosian (1-0) pitched a scoreless seventh inning to earn the victory. Luis Garcia pitched a 1-2-3 eighth inning.